General Dynamics Ordnance and Tactical Systems–Canada has more than 100 years experience in the manufacture of small caliber ammunition, including ball, tracer, blank and armor-piercing cartridges. The 0.50 caliber (12.7 mm) RRA Ball and Tracer ammunition provide the same ballistic characteristics of full range operational ammunition up to 1000 m. The tracer version is a ballistic match to the ball round. 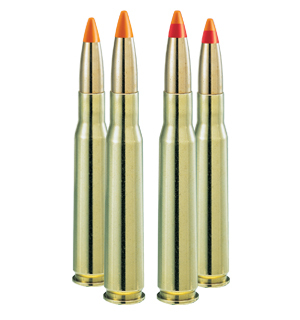 The 0.50 caliber RRA has a maximum range of 3,500 m (3,827 yd.,) roughly 50% shorter than that of conventional service ammunition (see Figure 2 below). This is a major advantage when training near urban areas, since users can fire the 0.50 caliber RRA, on a 7.62 mm range, without changing the maximum distance of the safety template. The 12.7 x 99 mm (.50 Cal) Limited Range Training Ammunition (LRTA) cartridge is designed for use on ranges where ricochet and stray bullets travelling beyond standard target distances pose a problem. The 12.7 mm LRTA, for example, can be used on a 7.62 mm firing range without exceeding the safety zone area (safety template) defined for 7.62 mm bullets. Accuracy is comparable to the M33 Ball out to 800 m, but it falls off thereafter, as the projectile destabilizes. The LRTA cartridge functions normally when fired from machine guns without auxiliary equipment. Its bullet, which comprises a gilding metal jacket and steel core with rear fins, is non-toxic. A lead free primer is under development. The 12.7 x 99 mm (.50 cal) Limited Range Training Ammunition, Tracer (LRTA-T) cartridge is used in conjunction with the LRTA cartridge. It has the same ballistic characteristics as the LRTA as well as a tracing capability out to 800 m. Its bullet, which, in addition to the tracer mixes, is made of a gilding metal jacket and steel core with rear fins. It contains no heavy metals. A lead free primer is under development.